Kwakiutl (Kwakwaka'wakw) Tribe, circa 1880. This ChiefÕs frontlet, carved of alder(?) 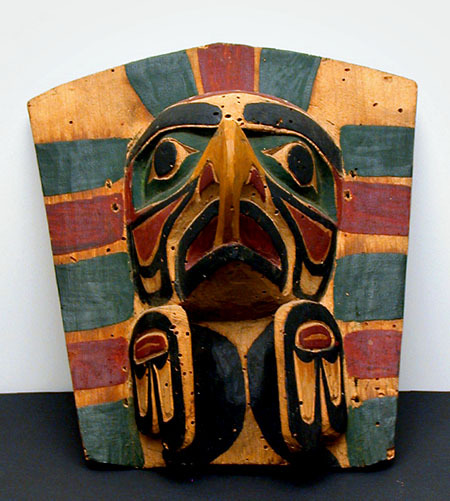 wood, native natural and trade paints: green, red, yellow, black, and natural, in the form of a hawk or seahawk. Frontlet is sold with three pages of documentation from 1969 -1979. 1) Mrs. B.C. Cadwallader, an early Kwakiutl (Kwakwaka'wakw) family, Fort Rupert, British Columbia, Canada. Sold in 1968. 2) Michael Johnson, Seattle, WA. Sold in 1969. 3) Alan Backstrom, Seattle, WA. 4) David Storie, Seattle, WA. Sold in 1979. 5) Robert Ohashi, Seattle, WA. 6) Edward S. Ohashi, Los Angeles,CA.